Bilāl b. Rabāḥ (Arabic:بلال بن رباح) known as Bilāl al-Ḥabashī (Arabic:بلال الحبشی) was a companion of the Prophet (s) and the one who was assigned to perform Adhan (call to prayer) in the time of the Prophet (s). Bilal was among the first persons who converted to Islam. He was in charge of the bayt al-mal (treasury) in the time of the Prophet (s) and accompanied him in all battlefields. Bilal lived for a few years after the Prophet (s) taking no orders to call for prayer in the meanwhile, save for few cases. Based on the famous report, he was buried in Bab al-Saghir cemetery, Damascus. Bilal's family were originally from Nubia in northern Sudan and southern Egypt. Bilal's father was among the captives of Abyssinia and he himself was born in a slave family of Banu Jumah (or Sarah) tribe which resided in Mecca. Some believe that he was born three years after the Year of the Elephant. He was also regarded as Ibn Hamama for his mother was named Hamama. Abu 'Abd Allah was his famous teknonym, and he had other teknonyms as well. He was also regarded as Habashi, Qurashi, and Taymi, according to his origin. Bilal was described as to be tall and slim, with a rather dark skin color, a bent back, long gray hair and a delicate face. There are different accounts of Bilal's marriage. On one account, al-Baladhuri refers to his marriage with a girl from Banu Zuhra, and on another account, he refers to his marriage with a girl from Banu Kinana. It is also said that Bilal decided to get married in a trip to Yemen together with his brother. When he proposed for marriage, he introduced himself as follows: "I, Bilal, and this man, my brother, were both servants from Abyssinia. We were misguided, and God guided us [to the right path]. We were slaves and God emancipated us. If you let us marry your daughters, then thanks to God, and if you do not, then God is the greatest". Before making their final decision, the family of the girls went to the Prophet (s) and asked for his view. The Prophet (s) recommended Bilal to them three times and said, "Who do you want better than him; he is an inhabitant of the Heaven". Whereas some authors maintain that Bilal did not have any children, al-Sakhawi refers to his son, 'Umar, as a transmitter of hadiths from him. Ibn Athir mentions a person called Halal b. 'Abd al-Rahman who was from the progeny of Bilal. He was among the first persons to convert to Islam, and despite bearing excruciating tortures of Meccan idolaters, Umayya b. Khalaf in particular, he did not deny his beliefs. After months of bearing torture and agony, Bilal was bought and released from slavery. Some believe he was released by Abu Bakr, however, it is not historically certain. Abu Ja'far Iskafi, the master of Ibn Abi l-Hadid, has narrated from al-Waqidi, Ibn Ishaq, and others that the Prophet (s) has released Bilal. Likewise, al-Shaykh al-Tusi and Ibn Shahr Ashub perceive him to be released by the Prophet (s), and what is narrated from the Prophet (s) that "I would buy and release Bilal, if I could afford it", does not correspond to historical facts, since lady Khadija (a) had supplied the Prophet (s) with all her wealth to be expended for the sake of Allah. Furthermore, Abu Bakr was not wealthy enough to be able to buy and release tortured slaves like Bilal. After his release, Bilal joined the Muslims community. He became the first Muslim to perform Adhan (call to prayer) and accompanied the Prophet (s) in his traveling and residency. He was counted among the "Nujaba" (noble community) and close companions of the Prophet (s). Bilal was in charge of the bayt al-mal (treasury) in the time of the Prophet (s) and accompanied him in all battlefields. In the Battle of Badr, 'Umayya b. Khalaf and his son were killed by Muslims at his request, and according to some accounts, Bilal himself, killed 'Umayya. The Holy Prophet (s) instituted the bond of brotherhood between Bilal and 'Abd Allah b. 'Abd al-Rahman Khath'ami, and according to Ibn Hisham's (d. 218/833-4) statement, up to Bilal's time, Habasha and Khath'am had the same category in the treasury. On the other hand, some have claimed his bond of brotherhood with 'Ubayda b. Harith or Abu 'Ubayda al-Jarrah. However, this cannot be true, considering Bilal and these two to have been from Muhajirun, while the bond of brotherhood would be held between the Muhajirun (the Emigrants) and the Helpers (Ansar). Bilal was the first Muslim appointed to perform Adhan (call to prayer). It is reported that he would mispronounce "sh" as "s", accordingly which the Prophet (s) has said "his "s" is considered as "sh" by Allah". The day on which Mecca was conquered, following the order of the Prophet (s), Bilal went on Ka'ba and called for prayer which made the pagans of Mecca really disappointed. After the demise of the Prophet (s), Bilal took no orders to perform Adhan except on rare occasions. One of such occasions was when Fatima (a) asked him so. However, he left his call unfinished, because it reminded Fatima (a) of all the sufferings she had after her father's (s) demise, and that she couldn't bear the distress. Next was the time when he came to Medina to make pilgrimage to the tomb of the Prophet (s) and al-Hasanayn (a) (Imam al-Hasan (a) and Imam al-Husayn (a)) wanted him to call for prayer; a call which appeared very inspiring and impressed the people of Medina profoundly. The last occasion was by the time the Second Caliph had traveled from Medina to Damascus (in 17/638-9, as al-Tabari has recorded) and in a land called Jabiya, at Muslims' request, he asked Bilal to call for prayer. He accepted and people wept bitterly by his Adhan, recalling the time of the Prophet (s). Most sources have noted realizing the honor of Jihad and accompanying the Mujahidun (soldiers) as the cause of Bilal's emigration from Medina to Damascus and not call to prayer anymore after the demise of the Prophet (s), and they believe his emigration to had been at the time of the caliphate of Abu Bakr or 'Umar b. al-Khattab, while there is no reports of his participation in any war or conquest. In addition, it could be concluded from some reports that his emigration to Damascus was as an objection to some events that happened after the demise of the Prophet (s). Bilal migrated to Syria during the caliphate of Abu Bakr, and on other accounts, during the caliphate of 'Umar b. Khattab. On most sources, he migrated in order to do the jihad and join the mujahids. However, there is no mention of his presence in battles and conquests of Muslims. On some sources, after the demise of the Prophet (s), Bilal refused to pledge his allegiance to the First Caliph. Thus, at the command of 'Umar b. Khattab, he left Medina and went to Syria. Bilal was also a narrator of hadith, from whom a community of the companions and Tabi'un has narrated; for instance, he has narrated a long hadith from the Prophet (s) regarding the excellence of Adhan. Many hadiths are narrated from the Prophet (s) regarding the virtues of Bilal, such as; "Bilal was among the early believers in Islam", "he is the chief of all those who call for prayer", "the garden is eager for three persons; Ali (a), 'Ammar, and Bilal", "three black persons are the chiefs of the garden; Luqman the Wise, Najashi (the king of Abyssinia in the time Prophet (s)), and Bilal", and also a prayer is narrated from the Prophet (s) for him helping lady Fatima (a) with the house chores. Likewise, Imam Ali (a) has counted him among the early believers in Islam and acclaimed his purity and self-edification. Imam al-Sajjad (a) has recounted his merits and his arguments over the virtues of the Commander of the Faithful (a) with the opponents. Imam al-Sadiq (a) has marked him as "the righteous servant (of Allah), and "a lover of Ahl al-Bayt (a)". The exegetes of the Qur'an have considered several verses to be revealed regarding the virtues of Bilal and his companions; Qur'an 4:69, Qur'an 6:52, Qur'an 16:110, Qur'an 18:28, and Qur'an 49:11 and 12. Although some historians knew him as to have had no child, in his book, Sakhavi has mentioned his son, 'Umar, among those whom narrated hadith from him. Most history sources have recorded his death in 20/641-2 in Damascus, while 17/638-9, 18/639-40, and 21/642-3 are mentioned as well. Some sources have specified plague as the cause for his death. Based on the famous report, he is buried in Bab al-Saghir cemetery, Damascus. 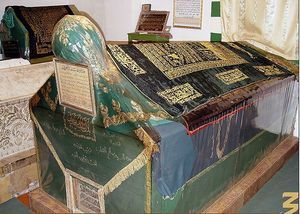 Some believe that his grave is in Bab Kaysan, Dariya, or Bab al-Arba'in, Halab, but Mazzi speculates that the one who is buried in Halab is Bilal's brother. He was more than sixty years old when he died. Some sources have reported his age at death to be sixty three, sixty four or seventy. The material for this article is mainly taken from بلال حبشی in Farsi Wikishia. Abu Nu'aym, Ahmad b. 'Abd Allah. Hilyat al-awliya' wa tabaqat al-asfiya' , Beirut, 1387 SH. Ibn 'Asakir. Tarikh madina Dimashq, Publication of 'Ali Shiri, Beirut, 1415 AH. Ibn Babawayh. Al-khisal, Ed. 'Ali Akbar Ghaffari, Qom, 1362 SH. Ibn Sa'd. Al-Tabaqat al-kubra, Vol.3, Beirut, Dar al-Kutub al-'Arabi, 1405 AH. Hilli Ibn Fahd al-. 'Udat al-da'i wa najah al-sa'i, Beirut, 1407 AH. Imam al-'Askari (a), al-Hasan b. 'Ali. Al-Tafsir, Qom, 1409 AH. Kashshi, Muhammad b. 'Umar al-. Ikhtiyar ma'rifat al-rijal, Publication of Hasan Mustafawi, 1348 SH. Mufid, Muhammad b. Muhammad al-. Al-Ikhtisas, Ed. Ali Akbar Ghaffari, Qom.